For attempting to pay a $10 parking ticket with pennies, an innocent man was attacked by police and hit so hard that he defecated himself. Royal Oaks, MI – A young man was recently attacked by court officers after attempting to pay a parking fee of $10. After the court refused to accept his payment they allegedly asked him to leave, and on security camera footage you can see him turn to walk away just before he is attacked. The video shows the guards grabbing him and choking him out, then slamming him to the ground. The attack knocked the man unconscious, and when he awoke moments later he had found that he soiled himself. To add insult to injury, the victim, Anthony Sevy, was then charged with Disturbing the Peace and assault, and while the assault charge was dropped, he was forced to plead no contest to the other charge, fearing that it would be his only chance of escaping a 2 year prison sentence for assaulting a court officer. Now, Sevy plans on filing a lawsuit against Royal Oak and the guards involved. “He wasn’t happy about [the fee] so, in symbolic protest, he brought back penny rolls to pay for his ticket. The clerk wasn’t too happy about that, they refused to allow him to pay with penny rolls. As he was leaving the courthouse with his back to the officer, the court officer began to choke him out, grabbing him, brought him to the ground. Mr. Sevy passed out and defecated himself,” his attorney Jonathan Marco said. “I don’t think anyone paying in penny rolls, whether it’s a preferred thing to do for a court clerk, warrants this type of this assaultive behavior and violation of constitutional rights. I think the more profound and long-lasting injury is the psychological injuries he’s suffering as a result of this. He’s supposed to be in a safe place. I don’t think that in everyday course of business, we poop our pants or go around defecating ourselves,” Marco added. It was not just the $10 or the principle of the parking ticket that had Sevy mad enough to go to the courthouse with pennies, it was also the fact that he would have been charged $1.75 to pay the fee online with a credit card, essentially tacking another 20% onto his fee. Royal Oaks is fairly notorious for their predatory revenue collection schemes in regards to parking fees and fines. Back in 2012, there was a huge local debate when Royal Oaks took advantage of a new state law that allowed them to revoke the driver’s license of anyone with 3 or more unpaid parking tickets. It was widely reported that this change could bring in nearly a million dollars in additional revenue each year. Prior to that, the city issued roughly 100,000 tickets each year, raking in millions. “Our downtown parking system does generate about $2.15 million in revenue per year for the general fund; in turn, about 70 percent of that fund pays for police and fire, including paramedics. If you want to avoid getting a ticket, then just check out the map on the city website and park in one of our three structures for a flat fee,” City Commissioner Jim Rasor told The Patch at the time of the controversy. Over the years it has become a popular form of peaceful protest to walk into a courthouse and pay a ridiculous fee in pennies. However, as the trend has become more popular, frustrated authoritarians have begun using the only tool they know or understand, violence. 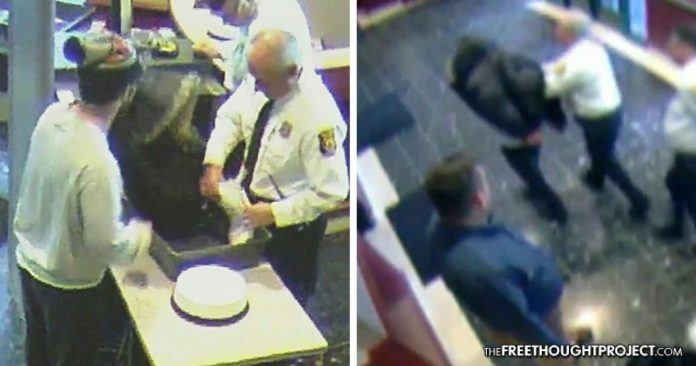 Earlier this year, police were called on a veteran attempting to pay a ticket in pennies. As The Free Thought Project has stated before, “police need you to break traffic laws” because writing tickets and receiving funds from doing so is a considerable revenue generator for police departments. It’s how police states maintain their control over the citizenry.